Well, it's not Monday Morning, but at least there's a report. With pictures. Although NONE of them are of ME. Mom owes me BIG TIME. So this weekend THEY - meaning THEM - went to this museum thing. They offered me an opportunity to go, but I thought it was more important to snoopervise the neighbour putting in his new deck. Look what I found on the camera when THEY got back. That's MUCH too big for Flat Pappy on his own! They didn't even bring any home for me! SOB! Not only that but Puppy is taking up more and more of my floor. To continue our Adventures with Flat Pappy, from Sunday, I made sure he got a chance to see the Totem Pole. Then, at one place, you have a choice of going down the stairs, or taking the elevator. 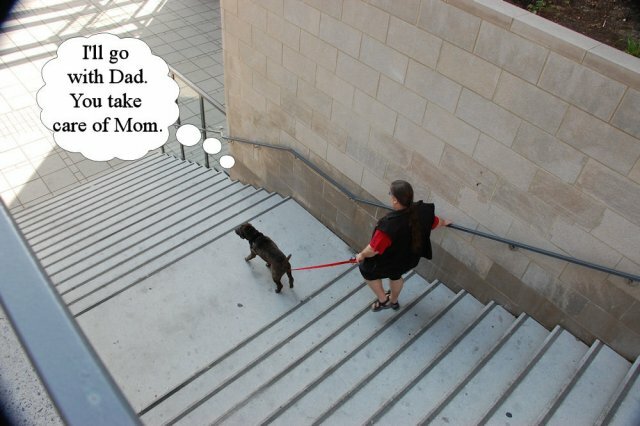 Well Puppy's wheely thing doesn't do stairs all that well so Mom, Puppy and Flat Pappy took the elevator. Dad and I took the stairs. ..and when they came out. Phew! That's Sunday's Noseventure! Now Mom and Dad are trying to figure out where we should go THIS weekend! Gotta show FlatPappy the town you know. More Flat Pappy Noseventures! This is all still from Sunday. I told you we were really busy. So, in my city they put up these really nice signs to promote doggy tourism. What? Oh, Mom says it's to promote the other Provinces and Territories and that I just happened to see one with a dog on it. Are you sure Mom? Anyway, Flat Pappy and I also stopped by at the Chateau Laurier. Flat Pappy wanted to check it out and send the bill to his DawgMom but I told him what Uncle Marty's boss said about it. If you have to say the name in french, you can't afford it. Once I explained that the less money he uses on this trip, the more he'll have for treats, and food and rescue, he seemed to understand. Stay tuned for more Noseventures tomorrow! So the place Flat Pappy and I were investigating on Sunday is known as the Byward Market and it's right downtown where everyone can get to it. They sell all sorts of things there like flowers and fruits and vegetables and maple syrup and there was a fish store I REALLY wanted to go into but it wasn't open yet - we were there before a lot of stores opened. But look at all the pretty flowers we saw! 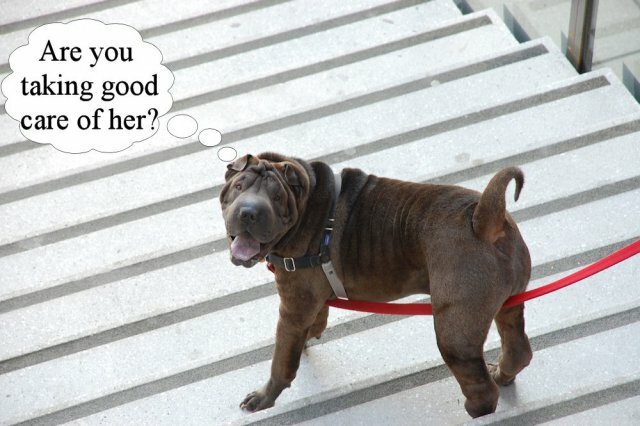 Of course a Pei can't go anywhere without being worshipped and admired. Mom wanted Flat Papster to try something called a BeaverTail. So we found the booth. They weren't open yet so we wandered around some more. It was hot so we had a pitstop. Half an hour later we were back but BeaverTails still wasn't open. Here I am making sure they aren't open and checking out their hours. They weren't going to be open for another HOUR! Pffft. Mom will find us another BeaverTail location. She promised. Wow, did we ever have a busy weekend! First of all Saturday it was raining, so we stayed home and vegged. Always good. But Sunday it was GORGEOUS! So we all went out to show Flat Pappy the town! 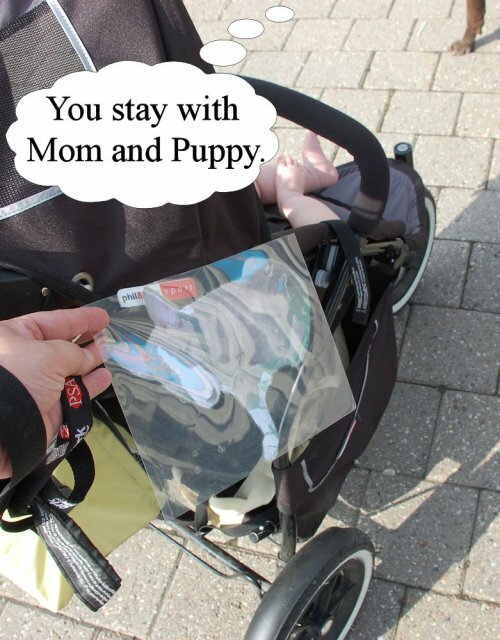 Then we split into two teams, I sent Flat Pappy with Mom and Puppy. I went with Dad. Two doggies all excited can be too much for one person to handle you know. Our first stop was the National Gallery of Canada and the giant THING in front of it. Mom appreciates you peeing on it Flat Pappy. I didn't have anything left by the time we got there. We didn't go and see them, but there are the Parliament buildings. And of course Flat Pappy wanted to visit the American Embassy. You wouldn't believe the forms and security checks he needed to go through just to snuff the trees inside the perimeter! That's it for now. To Be Continued! I have been SNOOPER busy this week. I've just been too exhauste-pei-ted to write. But hey, look at this, Photo Friday and I have photos to share! This is what I was doing earlier in the week: Snoopervising Mom and Puppy doing outside things. 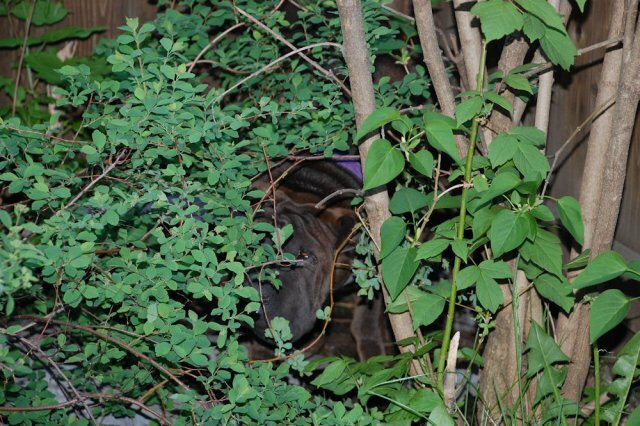 Since I was there anyway, I also snoopervised everything going on in my line of sight. You know, since I was there anyway. That was early in the week, then mid week - like Wednesday - I had company show up! FlatPapster came from Tennessee - via Australia. (From TN Bull Terrors Fame) That linky will also tell you all about this fundraising stuff that got Flat Papster here in the first place! Hi FlatPapster, welcome to my house! I had to give him a good sniff over, you know how it is right? 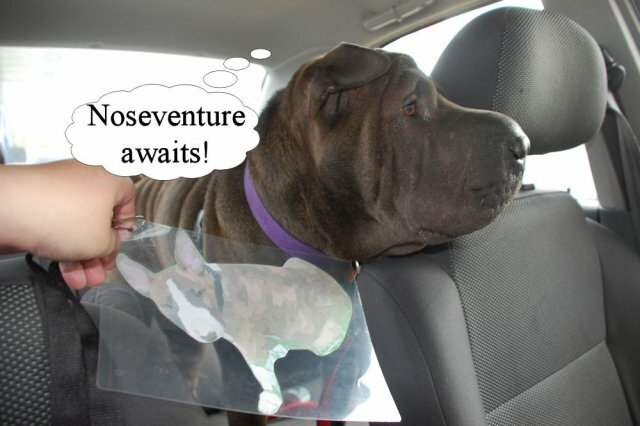 Well, in honour of FlatPapster's visit, Mom, Dad, Puppy, FlatPapster and I will be going for Noseventure sometime this weekend! WOHOO! I'm excited! So that was mid-week, then came yesterday. My Grandparents came over! There I am welcoming my Grandad. I was SO happy to see him I practically crawled into his lap! Apparently his eyes are closed because he was laughing. I tickle when I give kisses. Today I was off to Daycare to snoopervise them. 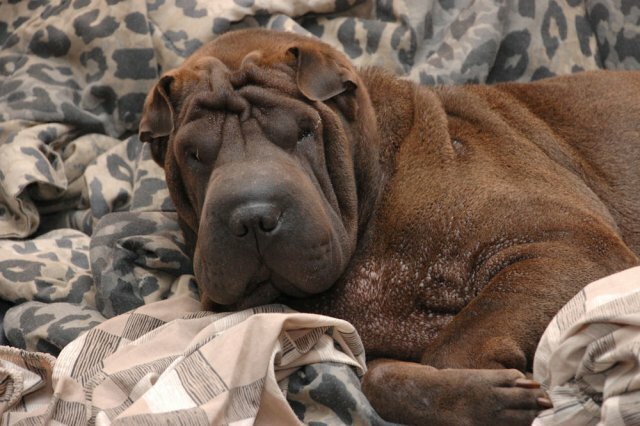 I am going to be SO exhauste-pei-ted at the end of the weekend I tell ya. But I am SO looking forward to it! So, what is everyone else doing this weekend? Well I don't know about you guys, but I had a Noseventure filled weekend! We went to the Garden Centre! Remember, I blogged about going there...last week? The week before? Anyway, I had SO much fun. There are SO many interesting smells there! I even got a treat, they keep them behind the counter, in case you ever visit my Garden Centre, you'll know where they are. I know this and dragged Mom in that direction first thing. So today, I will relax and rest up and hope there's another trip to the Garden Centre soon! Yesterday was Mom Day. I made sure to give my Mom lots of cuddles and Nose Kisses. I get the feeling that it wasn't enough though. She seems sad today. I'm sticking close by her to give cuddles on demand, I know that will eventually help. I could use a few ideas though, to help her feel happier faster. Ideas? I think she should take her camera out and take pictures of me.....ok, us, Puppy needs pictures taken too I guess. I think that should help her lots. Now to try and communicate that to her. Gotta go, she needs a cuddle! Mom taught me how to linky to pictures! See, you don't need opposible thumbs for everything! 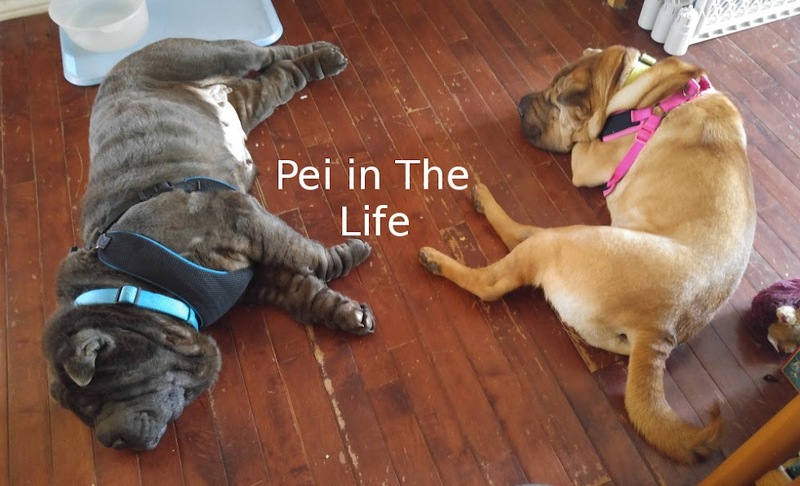 Welcome to Find the Pei Friday! Go ahead! 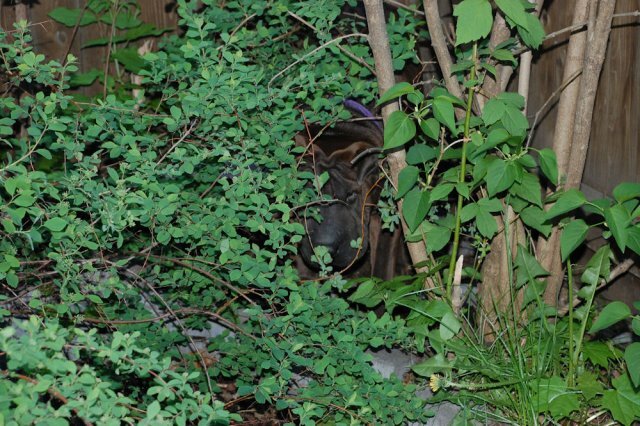 Find the Pei! 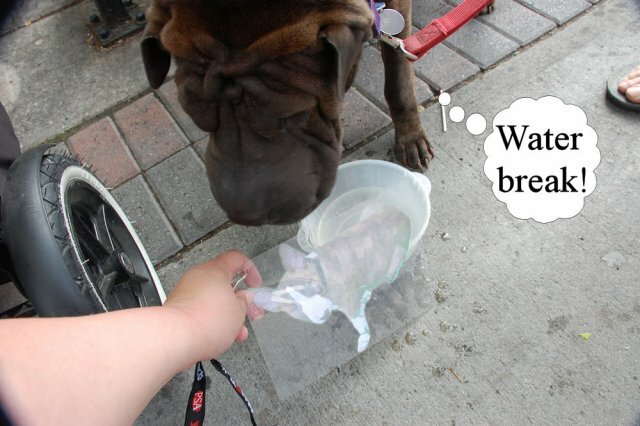 Well, I WAS going to post a picture last night for Wordless Wednesday but Mom and Dad offered me a Noseventure instead! I'm sorry guys, I chose the Noseventure. I hope you understand. Where was my Noseventure? To Aunt Brenda's! It was nice to see her. I haven't seen her in a long time. I had to give her a nose snuffle. You know how it is right? Anyway, here's the picture I was going to post on Wednesday. It's Puppy and I. As an aside, look at those ears! Mine I mean. Mom and Dad say I have very expressive ears. Anyway, it's grey and chilly and threatening to rain so I'm going to go and cuddle up on my bed and hope someone joins me for a cuddle. Like Mom. Do you think she'll get the hint? So there I was, snoozing away on my bed when Mom and Puppy come upstairs and they look at me and say "Bolo. Fjord!" My long term readers know that the word Fjord means ADVENTURE! 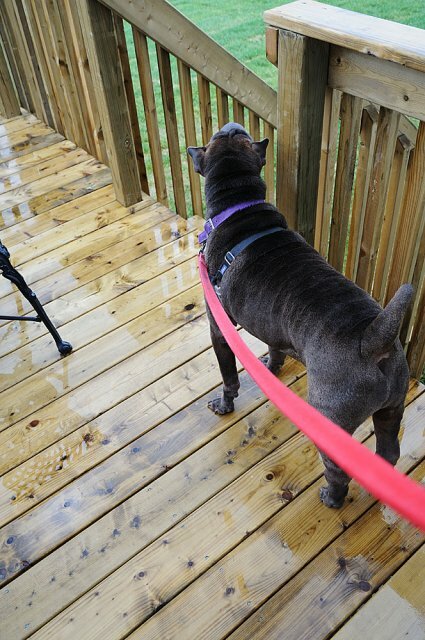 So Mom leashed me up and then got Puppy ready and we headed out the door and WOHOO! There was Daddy with the car! That's SO cool. We had to drop Daddy off at work again though - bummer, it would have been much cooler if he had come with us. Anyway, I was totally worshiped by all the wonderful ladies who work at the Garden Centre. Just as I was thinking we were going to be leaving, Grandma and Grandad showed up! Oh my Dog! This was like a Perfect Noseventure! Wish Daddy had been there too, that would have been Super Perfect. So I had to help Grandma pick out a plant that smells. I think she could have just invited me to stay at her house, I'm nice and fragrant, in a corn chip shar pei kind of way. 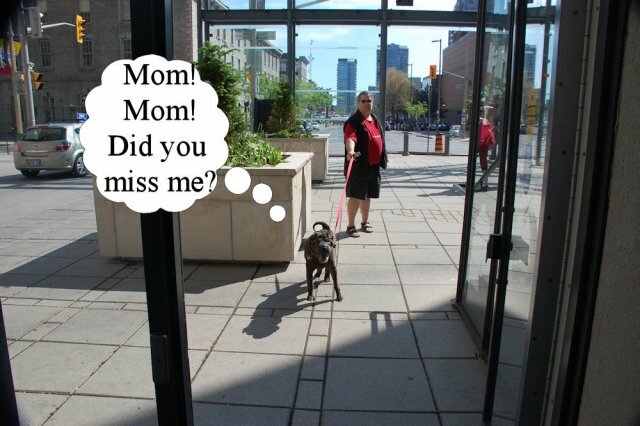 Eventually we did go back to the car, but Mom didn't take us home. She took us to Grandma and Grandad's house! 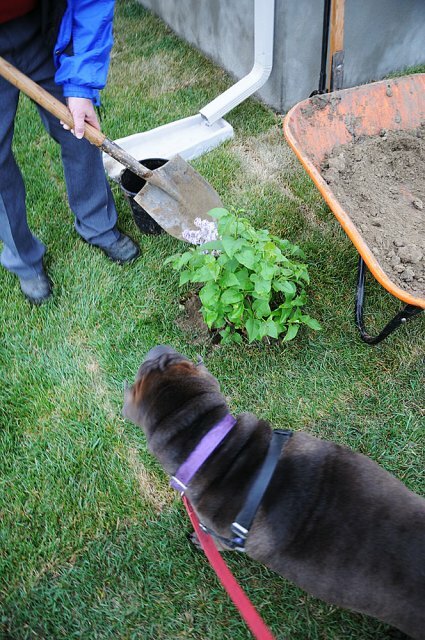 We had to plant the smelly tree thing. Only one problem. It started to rain. And we all know that -I- don't like to get wet, so we hid out in the kitchen until the rain stopped. See? It's stopped. And here's the smelly tree that Mom calls a Lilac. Nice job Grandad! Good thing I was there to Snoopervise eh? Thank you Grandma and Grandad for letting me Noseventure at your house! 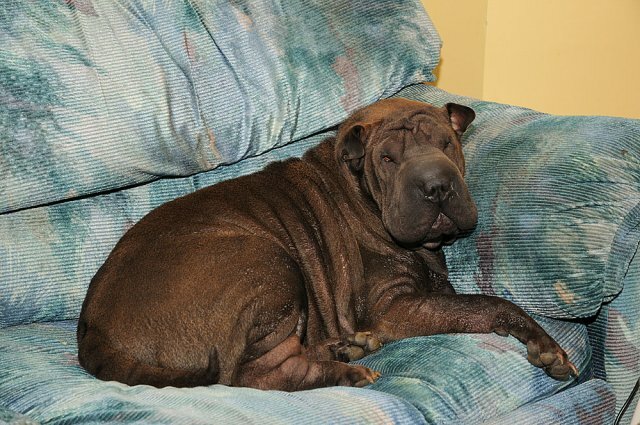 Thanks to you, my wonderful friends, Mom not only took pictures of me for Find the Pei Friday - they're good pictures, but you'll have to wait - she also is downloading the pictures as we speak! 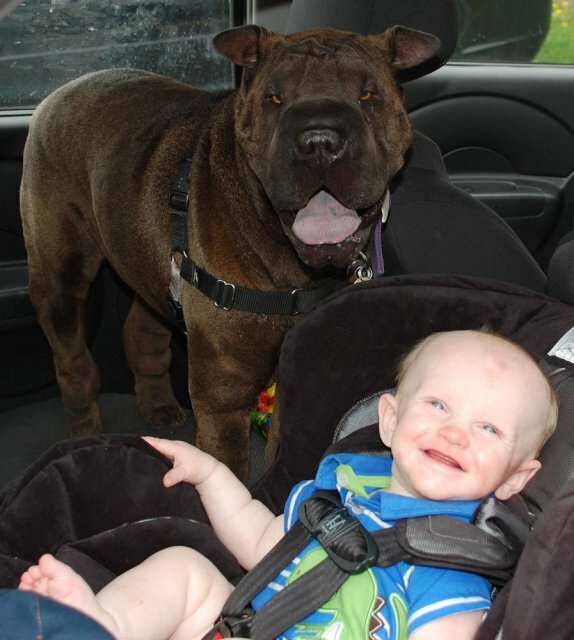 This deserves the Happy Pei Face Picture! So we'll at least have pictures for this week. I'd better give Mom back the computer so she can resize the pictures an upload them to our gallery. Mom even brought the camera out! So, where are the pictures? Yeah, still in the camera. Sigh. It's a start I guess. I keep telling Mom that you'll forget what I look like and she gives me this LOOK, then she says they can look at your header picture Bolo Pei, or any other picture on the blog. Sigh. It's just not the same is it? Could someone tell Mom that it's just not the same?